Dell EMC made a splash with the introduction of PowerMax and other storage products this week, but an anticipated free update to its venerable midrange SC Series is drawing the attention of partners who say the release could significantly increase system performance. The release is significant for the performance increase described by Tanenhaus, but also for the commitment it signals that Dell has to the SC Series, also known as Compellent, on the part of Dell EMC. Midrange storage is one of only a few areas of clear product overlap between Dell and EMC, and some speculated that certain lines, including Compellent, would be discontinued in the wake of Dell’s acquisition of EMC in late 2016. Jeff Boudreau, Dell EMC senior vice president and general manager for midrange storage, confirmed that the release, known as SCOS 7.3, is indeed on its way, but said the company isn’t talking specifics while the update is being test-driven by some customers and partners. While the SCOS 7.3 release does highlight Dell EMC’s commitment to the popular Compellent line, Boudreau acknowledged that he is undertaking a longer-term effort to streamline the company’s midrange storage portfolio. That portfolio, Boudreau said, includes about 48 brands and a dozen different storage subsystems. Maintaining them all independently threatens to dilute the business’s R&D budget. Boudreau’s strategy will likely include decisions about whether to develop, or simply maintain the technology in those product lines while consolidating branding, he said. Today, Dell EMC’s midrange storage stable includes Dell’s Compellent SC and EqualLogic PS series systems, as well as EMC’s Unity, VNX and certain XtremIO models, among others. 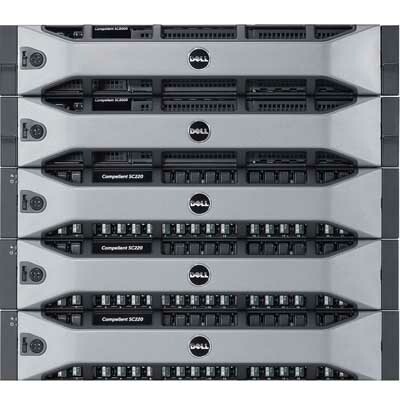 Dell put the EqualLogic PS series in maintenance-only mode before the acquisition. The code update is aimed at SC Series arrays from the SC40 and up, and effectively doubles flash performance and capacity, Tanenhaus said. In addition to the performance improvements, the update adjusts how ‘hot spare’ drives are handled to allow customers access to a greater number of usable drives, and improves intelligence around how pathing is handled between multiple systems, said Rick Gouin, CTO at Winslow Technology Group.